(PDF 787KB). Or order as a printed book from Lulu (or Amazon). Out of about 17,000 hymns in the Vedas, slightly less than half relate to Metaphysics, which Bhagavad-Gita says is the supreme science. The remaining hymns pertain to mantras (in praise of God), scientific rituals/ceremonies and aryankas (simple rules for the old people). However, the Vedic metaphysics is meant for all ages. It relates to social and physical sciences, divine nature, cosmic laws of necessity, soul, spirit, formless and ineffable Supreme Soul and many other subjects. No single book can comprehensively cover Vedic metaphysics. 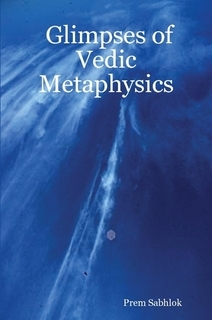 This book only gives glimpses of Vedic metaphysics for the seekers of Vedic knowledge. The methodology utilized is dynamic equivalence and not formal equivalence. Every effort is made to give glimpses of Vedic metaphysics truthfully and without any distortion within my limited knowledge and capacity. COPYRIGHT NOTICE: Please ensure that all citations from this book are adequately referenced. This site is maintained by Sanjeev Sabhlok.